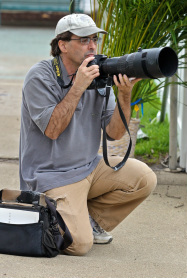 Rich was named the Pennsylvania Press Photographers Association Photojournalist of the Year three times for his work at The Meadville Tribune and has won several other state, regional and national awards. Rich attended a two year photography school finishing in the top 10 of his class. He earned his Masters degree in Fine Arts from Edinboro University in 1997. He has worked for portrait studios in Rhode Island, the Public Relations offices at both Edinboro University and Rhode Island College and worked for both weekly and daily newspapers for the last 25 years. He also teaches currently at Allegheny College. To view Rich's work follow him on facebook or visit his website by clicking here!